Some people have asked recently about a “For Lease” sign on the portion of Westpark slated for commercial development. The sign, near Kitsap Way and Oyster Bay Ave., apparently was put up in error. The redevelopment plan for the 82-acre site has about five acres designated for retail use along Arsenal Way and at the corner of Kitsap Way and Oyster Bay. The properties are intended for sale, the Bremerton Housing Authority says. A new sign that says commercial plats are “available now”, has already been put up. First Western Properties (College Marketplace/Olhava in Poulsbo) is handling the sales. 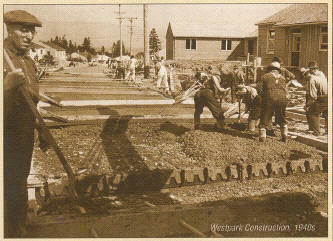 While working on the story I was struck by the long history of the housing project. For a history lesson, click this. It is a brief rundown on how Bremerton’s housing project came to be.